This small booklet is the latest limited edition booklet from the pen of Martin Tebay, proprietor of Red Rose Books. These days Martin, like this reviewer, lives in exile (in his case in Cumbria), but his writing makes it clear that his heart is still in his native Lancashire. As its title announces this one has a West Indian connection as well as a Lancashire one, and there is also a link with Martin’s adopted county as the subject is a one day match that took place in August 1934 in Dalton-in-Furness, a small town in Cumbria, albeit one around fifty miles from where Red Rose are based. 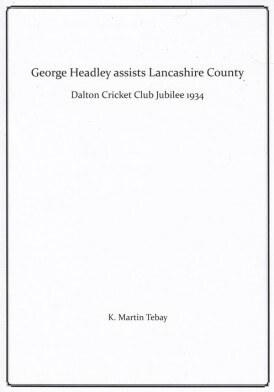 Unsurprisingly George Headley assists Lancashire County is about a game of cricket, albeit those who scour Cricketarchive for a clue as to the match concerned will learn nothing. The great West Indian batsman never turned out for Lancashire, although he was in the county of the Red Rose in August 1934, the first of six summers that he spent playing in the Lancashire League. Back in those days the biggest drawcard in the northern leagues was Headley’s countryman, Learie Constantine, a man who was all but guaranteed to fill a cricket ground with spectators. So when Dalton, to mark their Jubilee, invited the Lancashire club to provide the opposition for a special match to help them celebrate they must have been delighted when ‘Connie’ agreed to guest for the county. In the event Connie’s commitments to his club meant he could not play, although the man who at that stage had recorded seven centuries in his twelve Tests was a pretty good replacement. Come the day of the match the contest saw a Lancashire side pitted against a team of North Lancashire and District League amateurs, augmented by a couple of league professionals. Lancashire did the Dalton club proud. That seasons’s Champions were led by their usual skipper, Peter Eckersley. As well as the great West Indian there were also five men who had or would play for England. The outcome of the match was perhaps predictable. Using local press reports Martin Tebay has faithfully reconstructed events and produced an interesting read. He has produced the book on good quality paper, included three photographs and the scorecard of the match which, as I say, does not appear on Cricketarchive. The result has been published in a signed and numbered limited edition of 56 copies, one for every run that Headley scored in the match. The booklet will not be of wide appeal, but anyone with an interest in Lancashire cricket, George Headley or limited editions generally should give serious thought to shelling out the modest £6, inclusive of UK postage, that it will cost to have a copy wing its way to them.